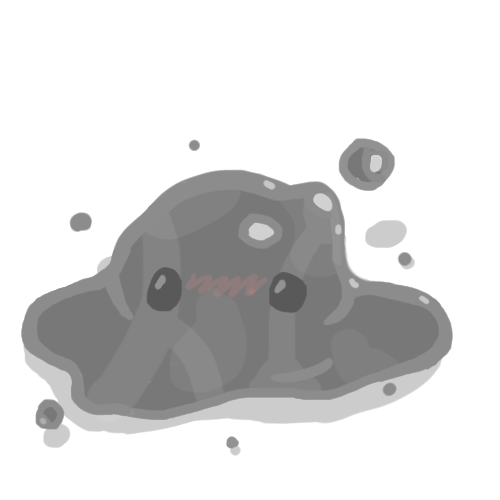 This slime is a small puddle slime shaped slime that is a monotone gray. It has the rarity of a gold slime, and can not spawn in the presence of a rancher, but if an extractor, medipad, taming bell, or jump pad is nearby, the slime will take over the machine, and perform a more powerful version of the gadget's function, in exchange for carrots, pogo fruit, or hen hens. They can be removed by picking up the gadget, and placing it down, if possible. Extractors will be favored by this slime, and if an extractor is hijacked, the Slime will produce the resources that the extractor would normally produce, but indefinitely (as long as the rancher gives it food, of course.) When the slime has hijacked a gadget, it looks like a small gordo, except the interaction end of the gadget is exposed. It is fed like a gordo, but it will not burst. After it is fed, it will undergo the hunger cycle of a normal slime. It will not, however, consume spicy tofu, as it can only eat normal unfavoured foods. Slimepedia entry: The Gadget Slime is a distant cousin of the gold slime that has discovered that hijacking slime science gadgets, and holding them for ransom is an excellent way to get ranchers to part with their food. However, this is not too bad for the rancher, because the function of the gadgets has been optimized. Rancher risks: These slimes pose no direct danger, however, like the gold slimes, ranchers are tempted to ignore their other slimes in order to produce gadgets that will attract the Gadget Slimes. Plortnomics: The Gadget slimes produce no plorts of their own, however when attached o an extractor, they can permanently exchange unfavored foods into useful slime science resources. Last edited by lbyrne2 on Sat Apr 14, 2018 12:29 pm, edited 1 time in total. I'd like to welcome you, but EmeraldPlay already did it. thanks guys. have any deeper thoughts or nitpicks? At first I thought that this slime would be a bit too overpowered with it making extractors produce indefinitely, but then I realized that it's justified by the slime's rarity. What would happen if I... didn't feed it? Or couldn't find it (If one existed)? well, they would last a couple of weeks and then they would leave. giving people even more incentive to keep track of gadgets. they also do not take over any other gadgets other than the ones listed. also, how do you reply directly. What do you mean, reply directly? Noggy05 wrote: What do you mean, reply directly? Noggy05 wrote: Press the '"QUOTE' button. With the gadget slime, suppose it hijacked a market link. Perhaps it would randomly double plorts that enter it, similar to Mochi's Extra Mile. And if you have Mochi's Extra Mile, and it happened along with the Gadget Slime Doubler, then it would quadruple the plorts initial value. That would be quite an interesting find. Charliethecadet wrote: With the gadget slime, suppose it hijacked a market link. Perhaps it would randomly double plorts that enter it, similar to Mochi's Extra Mile. And if you have Mochi's Extra Mile, and it happened along with the Gadget Slime Doubler, then it would quadruple the plorts initial value. That would be quite an interesting find. hmmmmmmm... that seems like a good idea, but it would have to be an upgrade on the gadgets not listed on the OG post (because you have to work for M.E.M. it would be too op to get it by chance, and who puts a market link in the middle of the map anyway?) *rambling begins* Perhaps hijacked teleporters will have a warp terminal covered by the slime, that works like the warp depos before the little big storage update. These old warp depos would make a great addition to your teleporter... if only you could get them to work. costs 500 newbucks, doubles the chance of a gadget slime spawning in that area, but they will go to the teleport 100% of the time, even if an extractor is nearby. When the slime hijacks the teleporter, it will appear on both sides. the slimes will not touch a teleporter without this upgrade. the upgrade will be bought for every teleporter of the colour that you purchase the upgrade for. Upgrades will not appear for teleports that you have not unlocked yet. Art thanks to Xxcookid123xX, the winner of the contest!